I wanted to analyze my tweets, so I did a little programming with the twitteR package on R, which helped me download my last 781 tweets or so (about 10% of my tweets) by calling the twitter API. Here is a wordcloud of the things I tweet about with a few common words like “the” and “that” removed. 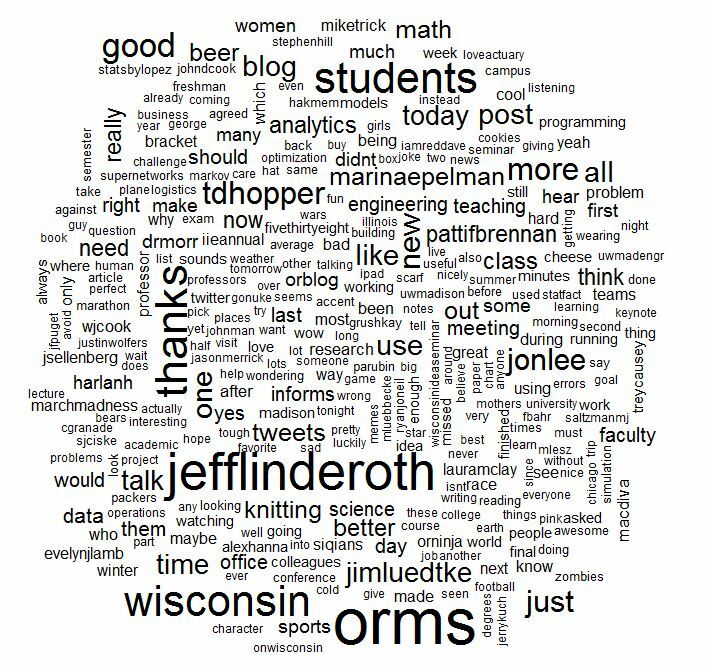 It looks like I spend a lot of time tweeting about #orms and Wisconsin to @jefflinderoth! A wordcloud of things I tweet about. Punk Rock Operations Research reaches 1000th tweet! Little more than a year ago, I decided to give twitter a test drive. After awhile, I determined that I liked it. I reached my 1000th tweet today. I’m surprised that I’ve made it this far, but twitter has grown on me. If you’re on twitter, please join me! This blog post was updated on 10/19 to add two new twitter links. hmm, #operres has more characters but is descriptive #orms less so but succinct. Put it to the community? So, I would like to ask the community. What are your thoughts: do you prefer #OperRes, #ORMS, or something else? Answer here, or answer on twitter. All of this assumes that twitter is a useful medium for having OR discussions. Tweets can sound a bit trite or flippant at times (OK, that was an understatement). It can be hard to say something in 140 characters, but it is certainly possible to contribute to some OR discussion in a brief message. Twitter is great for increasing access rather than directly providing content, since it is a great way to post links to OR blog posts and news articles about OR. How can twitter be best used to facilitate OR discussions? I am really impressed with my colleagues, who use blogs to perform scholarship and to take “peer review” to the next level (I used quotes because it’s not exactly peer review, although it’s certainly transparent). A lot of discourse and discussion can happen through non-traditional and technical channels. I can’t see this happening in scientific disciplines in the same way, but blogs (and technology in general) are changing academia. For example, I am very impressed with Cheryl Balls online tenure package blog (I saw this tweeted and retweeted by academics). Most of the course participants were interested in using blogs in the classroom. After discussing the logistics of required students to write a blog and setting boundaries and grading criteria, several people noted the advantage: Students write much better on blogs, where their peers can read their writing (as opposed to only their instructor reading what they write). Students are more invested in the process, since the transparancy makes them more vulnerable. And when outsiders comment on their blogs, they have an “Ah ha” moment that hooks them. Writing is so important in scientific disciplines, yet it is something that receives too little attention. And when it does, there is a lot of complaining. It seems like writing with technology (blogs or otherwise) could help students get excited about STEM fields as well as prepare them for all the writing they will do in their careers. You can watch some of the events streamed live here. Unfortunately, they are not recording the sessions. The panel also motivated me to twitter a lot more. I am slowly finding my twitter voice. Are there any hashtags that are useful for OR discourse? Send me a tweet with your tips!